The disclosure that follows here is truly intended to conform with the clinic's policy that requires us being transparent about all information if any, related to the clienteles. 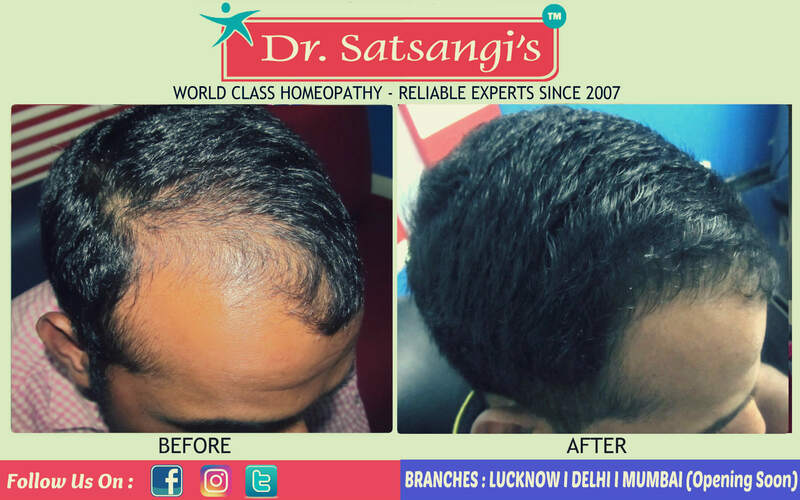 Photos, images, and videos shown in the website are 100% real time and of genuine patients of Dr Satsangi's Homeopathy treatment. However, the results to the concerned and related treatment are subject to variation from person to person across time. All the treatments facilitated in the clinic hold full authenticity provided under expert supervision. 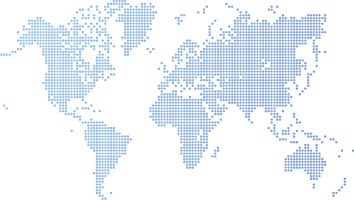 No one visiting this site is under any circumstances in any obligatory position to the organization. 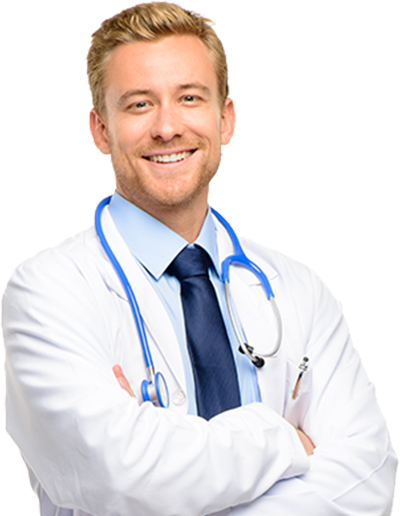 Further, if anyone is willing to undergo any treatment in our clinic are highly recommended and is abided to follow the process of consultation of the doctor first. To follow the process one can start off their treatment process. DISCLAIMER: Result may vary person to person. 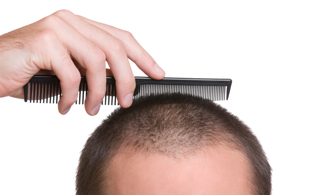 All hair follicles are replaced at different rates by the normal process of hair cycling. Hair growth alternates between phases of activity and rest. 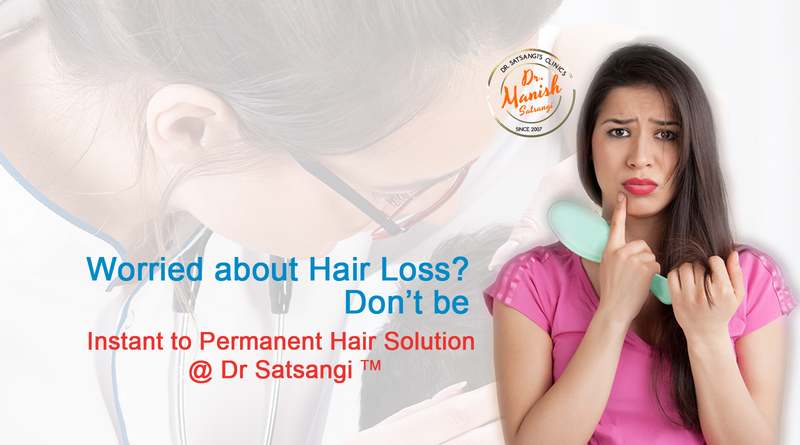 World Class Hair Loss Solutions with Years of Outstanding Services & Excellence Non-Surgical Solutions Female and male Hair Loss. Evident based live comparison of patient at each visit. Convenient Treatment follow ups once a month. 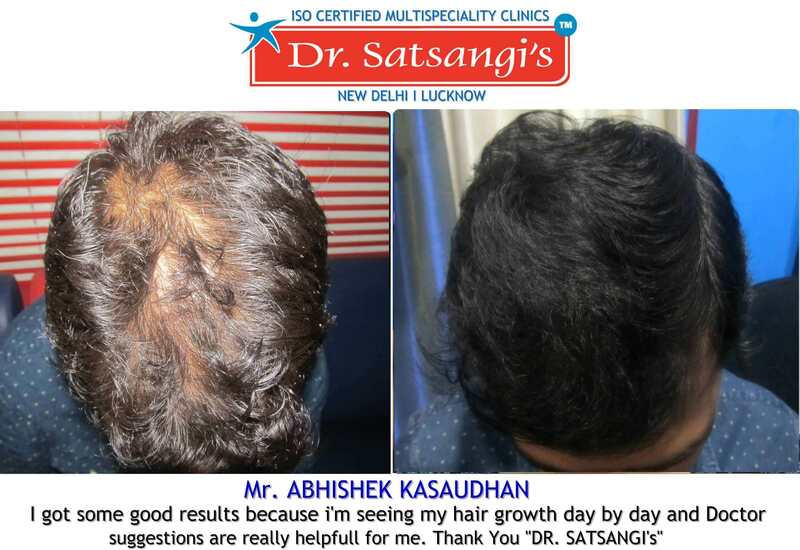 All patients are personally taken up by Dr.Satsangis who has strong 15 years expertise in hair loss treatments, he personally sees every patient very first day till they recover. 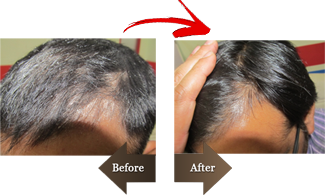 Successfully threated hair loss - since 2007 from immediate to permanent solution for hair, 98% patient satisfaction ,A D.S.I.R. report. 30 minutes consultation slot , personalized safe ,zero side effect treatment regimen. World class safe natural therapies , with goodness of homoeopathy. Convenient Treatment follow ups once a month & customised courses based on flexibility of timings . 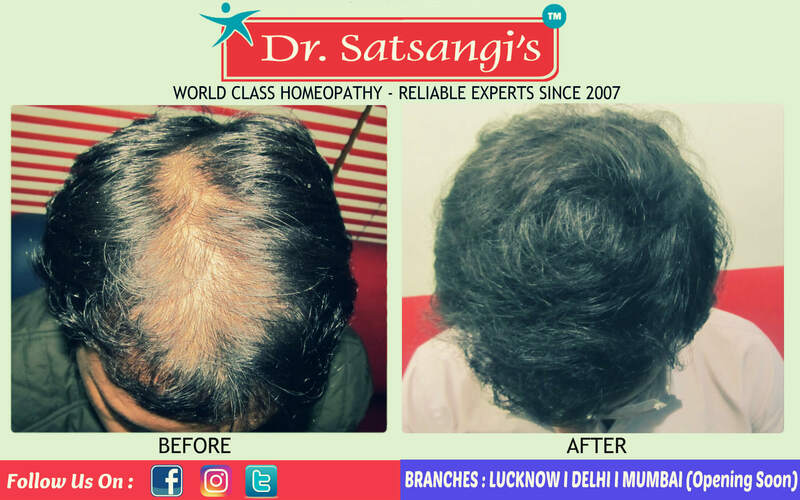 All patients are personally taken up by Dr.Manish satsangi MD & cofounder Dr Satsangis clinic pvt ltd having strong 17 years expertise in hair loss treatments, Be rest assured for 100% reliability, dependability & quality for that extra edge to Scale to your satisfaction. Result oriented treatment courses with unique advises given on basis of scientific assessment of you blood reports , nutritional deficiency & all health parameters , we call '360 degree' coverage . We share our success stories in term of patient satisfaction openly for our visitors for transparency of treatment & efficacy , this is unique To dr.satsangi ,No where else . How to improve hair texture ? Hair texture is decided by cortex of hair shaft , it is apart of hair structure made up by protein and fortified with lipids and some water content, Quality of cuticle enhances texture and tensile flexibility of hair , ie style retention and hair coverage scalp,Poor cortex is the result of hair shaft disorders & scalp infections , In some cases strong drugs or such agent may also put cortex fortification weaker, hypothyroidism and anemia are such co factor which may affect tensility and texture of hair , once these factor diagnosed and treated good hair texture is restored . 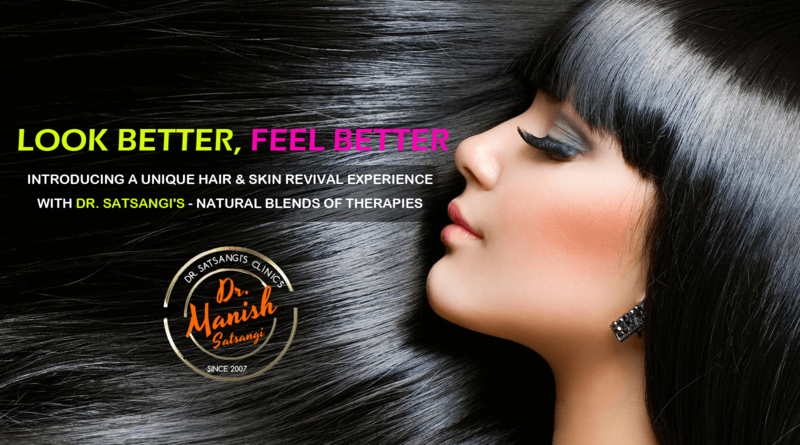 How do non surgical or Dr. Satsangis treatment/restoration works ? 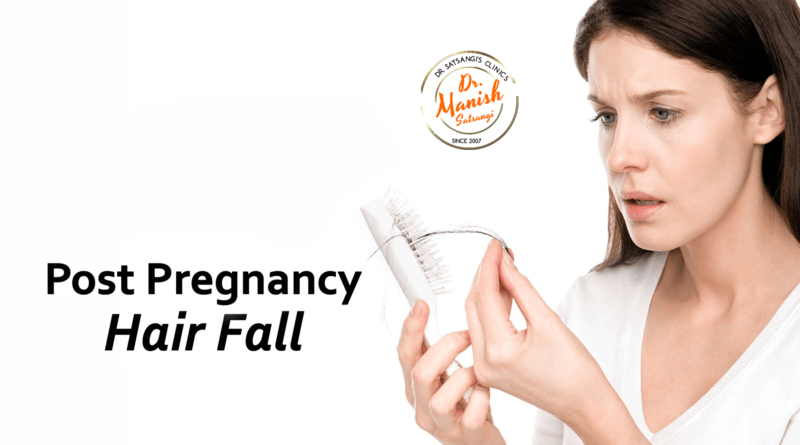 Frankly speaking , Hair fall in most occasion is a natural & physiological process, and in due course it get replaced by newer hair growth from hair papilla at base , this process goes unending until somebody faces Alopecia. Here we say alopecia or abnormal hairfall with ensuing baldness is a disorder labelled androgenic alopecia , Telogen alopecia , Secondary alopecia & so on ,At times certain scalp diseases presenting premature hair fall and shortening of hair cycle , giving enough room for vacant spaces on scalp termed as hair loss, In all such occasion it is a part of disease entity with definite pathology ,required to be probed , liable to be arrested , retarded or delayed , Hence concept of non surgical or natural disease treatment fits very well most cases of hair loss , any thing which is abnormal and acquired may be recovered or controlled , Thus in most cases correct evaluation of hair loss , scalp condition ,nutritional & blood factors , hormonal disturbances etc may be factor in disturbing hairfall and growth cycle , managing and treating anyone or all of them will be useful in correcting and restoring the balance. 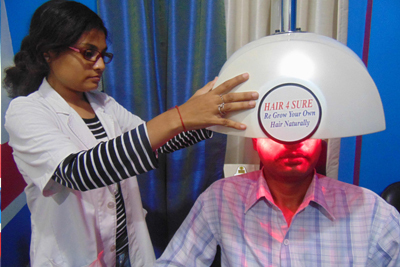 So we can understand very well if hairloss is correctly evaluated and diagnosed , there shall be maximum chances it is treated well with expected results But under the guidance and treatment of qualified and focussed doctor. No wigs No needles No surgeries No tear is required. 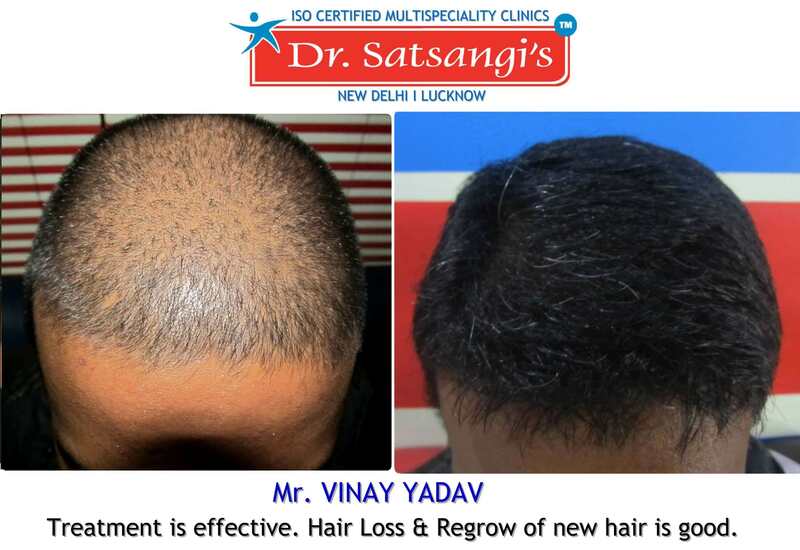 Associated with hair falll and baldness is miniaturisation and thinning of hair which adds to the baldness, here it is eminent to rule our the androgenic and genetic factor to contemplate on customised care and treatment . Meet our experts in evaluation at Dr Satsangi. 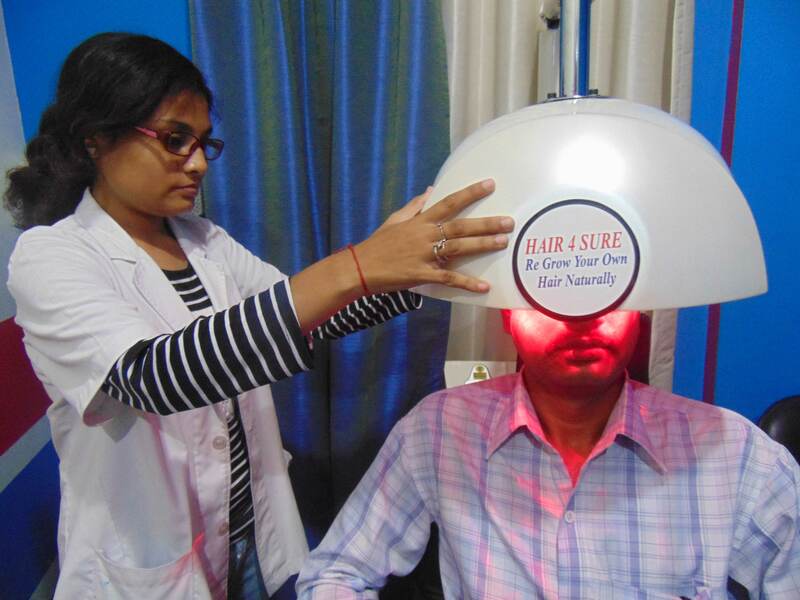 Lucknow/delhi or reach us to 7668200200 at earliest.happy & health scalp hairfull head ! What is hair thinning ? Egg yolk & oiling is essential , Truth or Myth! The word actually refers to Hair follicles dimensions in length & Girth (thickness), Hair As such is made up of tightly pressed protein & proteiglycan layers , three layers as visible in enhanced microscopy are outer layer ' cuticle' , from outside the second most layer;cortex' and innermost part of hair shaft 'the medulla ' these layers and their strength decides the quality of hair , specially cortex with pigment and protein structure comprises majority, cuticle is protective layer and its quality gives shine to hair , medulla has no major role, Thus thinning is a part of disease process found in different kind of hair loss , ranging from harmonal to nutritionals. As thinning results from poor cortex formation , which depends upon factors mostly deeper brought about by arterioles supplying blood to roots /papilla at stratum germinatum( deepest skin layer) & dermis ( where hair follicles emanates ). 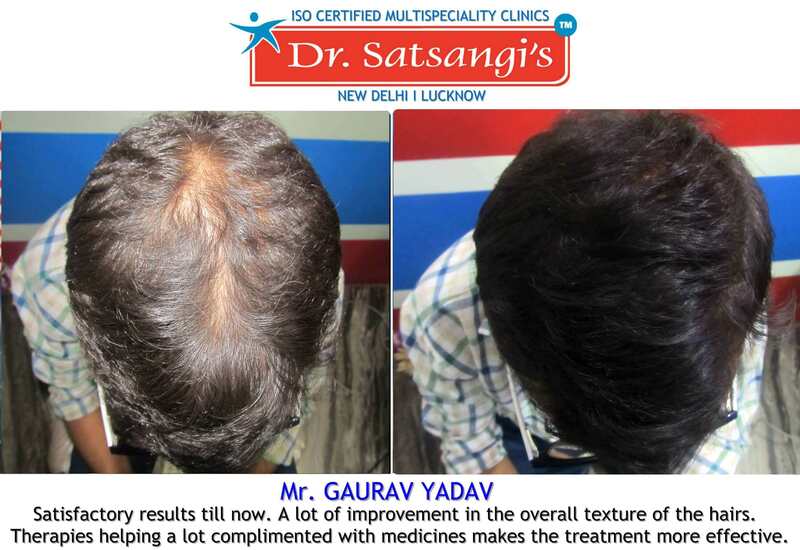 I am under treatment for last 5 months,result of hair growth is excellent ,i am satisfied with it, thanks a lot Dr Satsangi.In my opinion dr manish s. Is renowned personality in his profession. 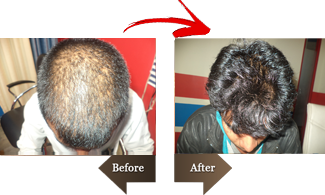 My hair recovery is good ,but i want to recover whole area,specially middle part of head ,overall i am feeling good.Thank you. Total staff service is so pleasant and doctor sahib is too goodin behaviour,all is excellent..
32 Years, Practising Laywer,Lko High Court. 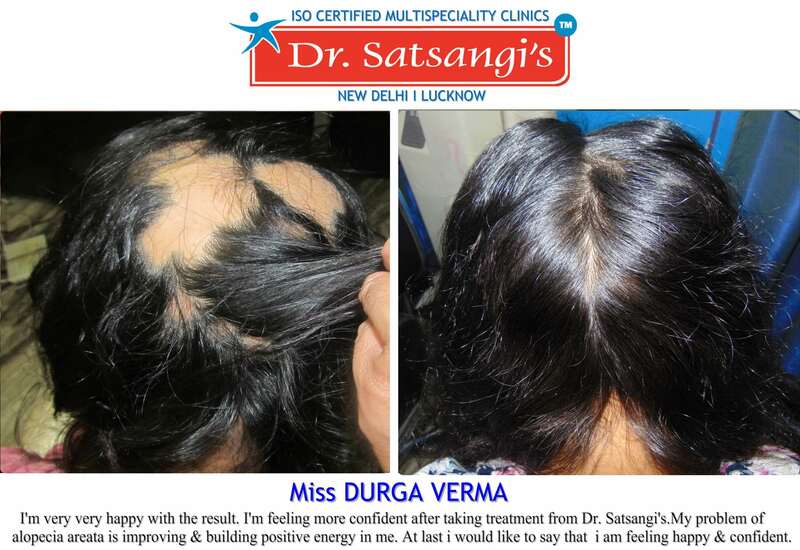 Effectively Recovers hair loss from the roots ,PermanentlyLong term results , With use of safe homeo Vitalisers Successfully treating even difficult & chronic hairloss, achieving 98% patient satisfaction(DSIR), Dr Satsangi Is the pioneer in its class for providingFirst time ' Evident based Hair treatment " Carefully documenting hair loss , well monitored Case improvement,With live videography showing One on One Photos of betterment to the testimony of patients.Close evaluation of blood reports parameters ,rectifying abnormalFinding& pathology with the help of advanced homoeopathy & Time to time referral with specialists.Understanding patients nutritional needs with easy to do guidance .All well documented & available for Public review in form of patient testimonials.Special feature of the treatment Is its 100% effectivement , visible sign of betterment in first 100 days of treatment , Improved confidence , developing A new Avatar .Come & Witness the revolution happening silently at Dr Satsangi , refining healthcare with redefined Homoeopathy Therapeutics. 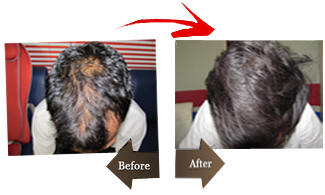 As name refers this is the unique solution for Advanced baldness & Exhaustive hair loss cases , This Provides ray of hope to Cases who expects quick recovery & Non surgical safe option, Awakened Public has More insight Into Side effects & Shortcomings of modern Treatment options available, People wanting something more but simultaneously no needles, no wigs ,no cuts no blood , Safe & quick key to hairfull scalp andHair loss control. 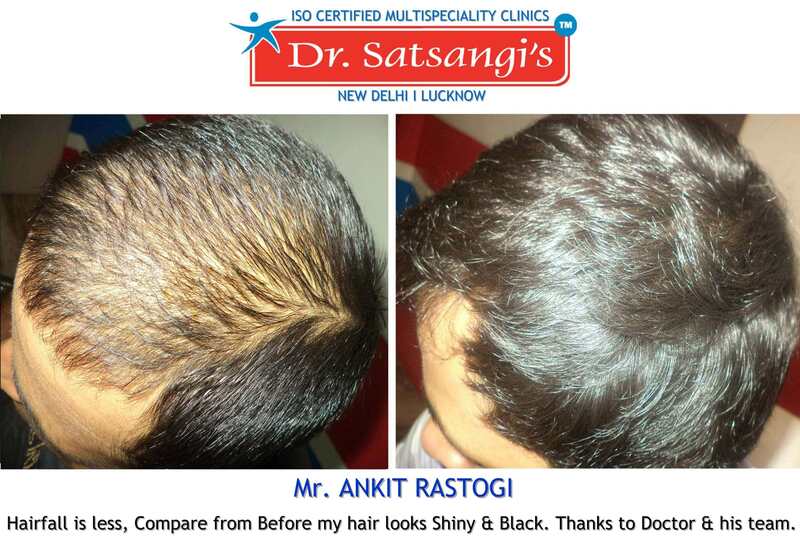 Dr Satsangi instagro courses offer goodness of advanced homoeopthy therapeutics , Secret Herbal tinctures & modern therapies, Mesotherapy with Electroporation, Latest safe Low light lasers & multiple light rejuvenation.Come & Witness all new revolution in hair loss treatment & management , the Contemporary way. All specialites Under one RoofAt Dr Satsangi , Patient finds unique combination of modern clinicals ,Accurate diagnosis and value added treatment ,may it be Arthritis ,joints pains , hypothyroidism, allergy & asthma ,Gynecology & harmonal issues , childhood disorders ,Acute illness & febrile seasonal compLAINTS , All finds gentle and effective recovery under leadership of senior & renowned medical professionals ,Dr. manish satsangi cmd and co founder Dr Satsangis clinic pvt ltd In his practice of 17 years believes in strict clinical criterias ,W.H.O principles applied for effective homoeopathy to cure tough diseases & evident based followups , We believe in reliable medical practice & 100% dependable doctors for you and your close one needs ,We take special privelege in guiding & educating patients for the disease sickness, With holistic approach ,nutritional management & regular guided exercises we make this happen , Be it chronic arthritis , psoriasis , asthma or general sickness, You are sure to find correct guidance , referal or treatment at Dr Satsangis centres .Come & witness the all new revolution in healing , the homoeopathy way .